Seeming to have been born with a ladle in her hand, Celebrity Chef Maneet Chauhan’s passion for all things culinary started at an extremely young age. Growing up in Punjab, India, her parents instilled a deep love of the power of food infused with spice. Her official epicurean education started in her homeland, where she graduated from the top of her class at the WelcomGroup Graduate School of Hotel Administration, India’s top culinary and hotel management school. 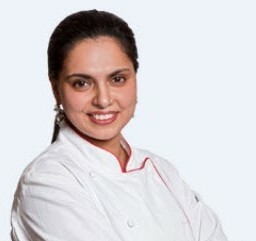 After interning at India’s finest hotels and kitchens, including names like the Taj Group, Oberoi Hotels and Le Meridian, it was off to the U.S. to conquer the foremost culinary school in the country, The Culinary Institute of America, Hyde Park, where she graduated with high honors and swept all awards in her graduating class. After some valuable fine dining field experience on the East Coast, Maneet decided to take a chance and jumped in her Mazda Miata and headed for Chicago. It didn’t take long for her to fall in love with the ‘windy city’ as she began her quest to find a job in a dynamic and challenging environment. Being the only woman to go up against 40 male chefs, this tenacious powerhouse was immediately hired to take the Executive Chef position and ultimately launch Vermilion, a contemporary Indian and Latin-American fusion restaurant. Under Maneet’s tutelage, Vermilion earned many accolades, including Chicago Magazine’s Best New Restaurant, Esquire’s Restaurant of the Month and Wine Enthusiast’s Best New Restaurant in the U.S. With Maneet’s guidance, Vermilion then set its sights on New York City and launched an equally impressive outpost which was voted ‘Best Import to New York’ by Time Out Magazine. Apparently the next thing to conquer was the world of food television and conquer she did. She started right at the top as she went head-to-head with Masaharu Morimoto on Iron Chef America. The only Indian female ever to compete on this iconic show earned her praise and ultimately a slot on The Next Iron Chef where she battled successfully against some of the premier chefs in the world—charming audiences with the joy and deftness she brought to the competition. She is now a full-time judge on the Food Network hit show, Chopped—which since her arrival has been nominated for a Critic’s Choice Award and earned her the prestigious James Beard Award of Excellence. At the end of the day it’s all about the food and Maneet’s cuisine has received exceptional reviews from Bon Appétit, USA Today, Time, Esquire, Travel & Leisure, Gourmet, Town & Country, Business Week and O Magazine, as well as getting a stunning 3-star review from the Chicago Tribune. Since leaving Vermilion in 2011, Maneet has established herself as an honorary figure and a leading volunteer for prestigious culinary schools, industry events and premier non-profit foundations. Additionally, she is simultaneously working on two cookbooks and is in the process of opening a restaurant with the acclaimed M Street Restaurant Group in Nashville.